He had trucked downstairs. The night was only beginning – like the night before – and the one before that. It was 7:54 p.m. Once a stripling in the full sway of manhood, he didn’t speak – just hauled off and descended the stairs. In the kitchen, she had cleaned crumbs off the counter. Probably the fourth time that day – or was it the day, the month, the year before – the crumbs—accumulating through obsolete years. “Crumbs,” Thelma Louise said to herself. “Crumbs. Crumbs.” She remembered how Gretel had scattered crumbs, she and Hansel. It was a grim thought. God, I’ve heard of affairs that are strictly platonic. “Oh, my god,” she said again – but this wasn’t a prayer, even though the gods had played a part in life’s determinations about the great beyond for thousands of years; she was, however, no Athena. There were bags under her eyes. Brown spots on her hands. Protruding veins. She finished wiping crumbs again. And again, she would swish the dishcloth under the faucet, depositing the tidbits in the sink before turning on the disposal. There were fruit flies on the watermelon. He had trudged upstairs now—as was customary – night, noon, and morning. He held out his hand, giving a biscuit to the dog1 who was, as usual, lying on her pallet. It had a discriminating appetite though it had once been a stray, a rescue. Now it slept in Thelma Louise’s bed, and snored. Sometimes, she would take her foot and kick it, whereupon it would hop off for awhile and return again – jumping on the bed and nudging itself against Hans, her husband who would kick it again – and so the night passed – like the night before – and the dog, without actual proof of residency, felt now a true sense of hominess. It was midnight now, and Thelma Louise couldn’t sleep. It was often this way, yesterday, the night before, the night before that. Time was not the shortest distance. The climate was changing; how, pray would it alter the eco-system? The children were grown and had flown the coop, and the cuckoo2 clock she’d bought in Germany years before; she was 19 then and had gone abroad a whole summer ­because her parents hadn’t wanted her to marry her college beau. Thought she might get interested in a swarthy Italian who would serenade her and take her on an all-night gondola ride. The clock, crumbs, it hadn’t worked for years—just sat there on the wall, the little bird on it’s perch, the door broken. “Crumbs,” Thelma Jean said—and she kicked the damn dog off the bed. “Beast,” she screamed. It had scoffed not just one tablet, but a whole pill pot – the “rejuvenix” pills that would turn back the clock on aging; take each night before bedtime and wait for morning. Now no refills. The dog’s name is not Sandy as in Orphan Annie. It is/ it was a traditional cuckoo clock with leaves and two lovebirds on top. Editor’s Notes: This is another experimental poem, with some hybrid structure, that at the very least subverts form while maintaining a prose disguise. 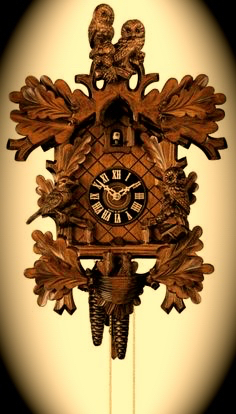 The image is that of a traditional cuckoo clock that has been warmed, enhanced and vignetted.